Alice Peters, mother-in-law of Upper Big Branch victim Edward "Dean" Jones, testified Monday at a congressional hearing in Beckley, W.Va. Peters said that Jones, a mine foreman, was told he'd be fired if he took his men out of the mine because of safety threats. Alice Peters heard so many stories about danger in the Upper Big Branch mine that she would call in fake medical emergencies to get her son-in-law out to safety. But she didn't call on April 5, when a massive explosion killed section foreman Dean Jones and 28 of his fellow mine workers. Peters told a congressional hearing in Beckley, W.Va., on Monday that she and her daughter sent faxes about the safety problems at Upper Big Branch to Don Blankenship, CEO of Massey Energy, the owner of the West Virginia coal mine. Blankenship didn't respond, Peters testified. Jones himself warned Massey "at least seven times," Peters added. "They told him if he shut down the [coal] production ... he would lose his job." 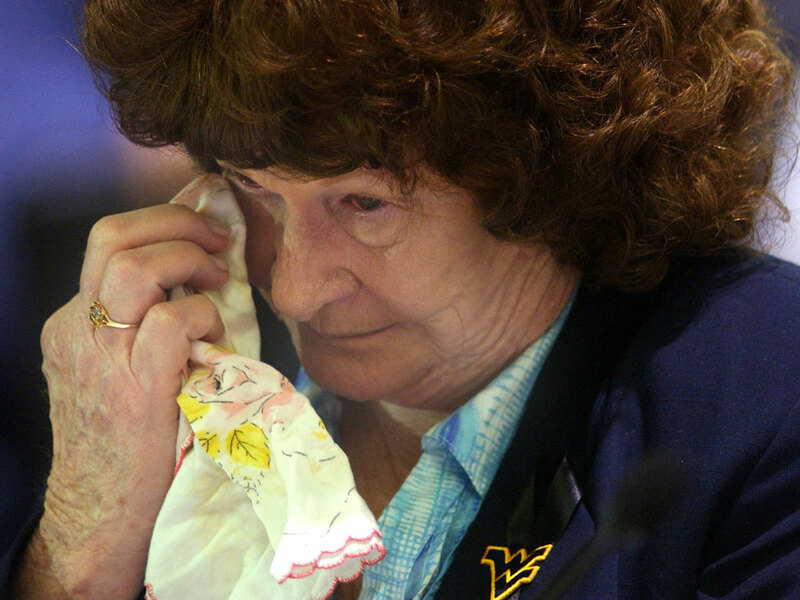 Jones and other mine workers were concerned about ventilation problems in the mine, according to Peters and relatives of other mine blast victims testifying at the hearing. Adequate ventilation disperses volatile and explosive methane gas and coal dust. 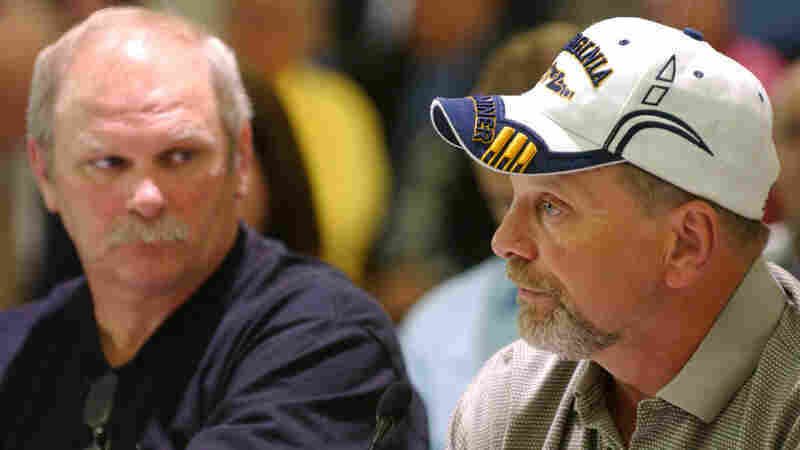 Clay Mullins (left), brother of mine disaster victim Rex Mullins, listens as Upper Big Branch miner Stanley "Goose" Stewart tells the House Education and Labor Committee that the mine "was a ticking time bomb" because of problems with ventilation and explosive methane and coal dust. "We never had proper air on that longwall," said Stanley Stewart, a 15-year veteran of Upper Big Branch, who has spent a total of 34 years working underground. The longwall is a mining machine 1,000 feet long that scrapes coal from a coal seam. "You couldn't see your hand in front of your face all day long" due to dust and gas, Stewart added. Steve Morgan's son, Adam, often complained to his dad about ventilation, coal dust and methane gas. Adam was a 21-year-old trainee, but his father spent 29 years in coal mines. Morgan told his son to go to his foreman and tell him when conditions were unsafe. "The boss pulled him to the side there by himself and told him ... 'If you're going to be that scared of your job there, you need to rethink your career,' " Morgan told the House Committee on Education and Labor. Mine officials at Upper Big Branch also warned supervisors underground when federal mine inspectors arrived, according to Gary Quarles, whose son Gary Wayne Quarles died in the blast. "The code words go out: 'We've got a man on the property,' " Quarles said. "Those words are radioed from the guard gates and relayed to all working operations in the mine." That "seems like obstruction of justice," noted committee chairman Rep. George Miller (D-CA). After the hearing, federal mine safety chief Joe Main said allegations of inspection warnings were being investigated by his agency and the FBI, which is conducting a criminal probe. Quarles also complained about mine safety oversight from the Mine Safety and Health Administration. "MSHA inspections at Massey did little to protect miners," Quarles said. 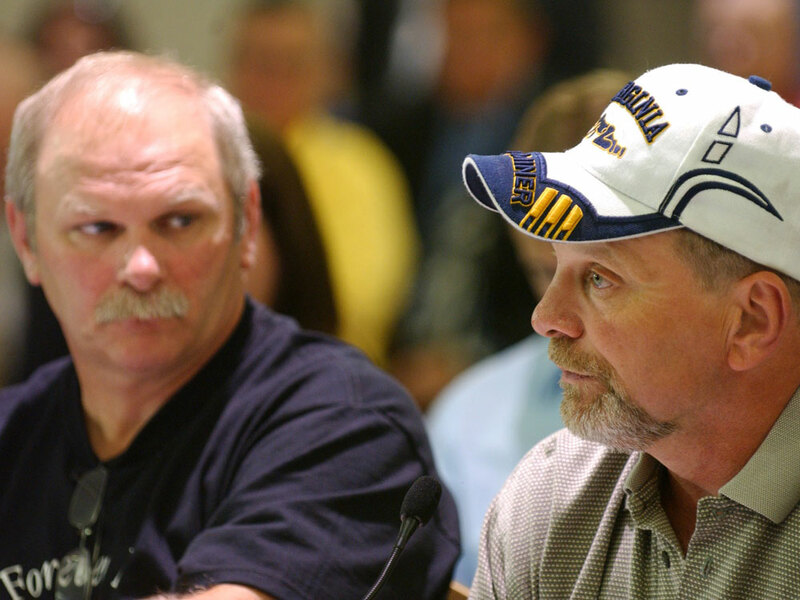 "MSHA has let us down many times." Some of those testifying have worked in union coal mines, and they said union mine workers have a formal role in safety enforcement. Upper Big Branch is a nonunion mine. "When you give people the right to not do illegal things, then they're going to not produce as much coal," said Eddie Cook, an uncle of Adam Morgan and a three-decade veteran of union coal mines. "And that's the name of the game ... profit to Massey." No one from Massey Energy testified at the hearing, but afterward the company issued a brief statement. "Massey does not place profits over safety. Period," the statement said. In its statement, the company did not address any of the specific allegations made at the hearing. "We appreciate the continuing efforts by Congress and federal and state agencies to determine the specific cause of the Upper Big Branch explosion," the statement continued. "Our focus remains on providing for the families affected by this tragic accident and cooperating with state and federal agencies to determine its cause." At a Senate hearing last week, Don Blankenship was skeptical about claims that company managers threatened workers with dismissal if they expressed concerns about safety. Blankenship also said Massey Energy doesn't tolerate managers gaming the inspection system by warning supervisors underground when federal inspectors arrive. In fact, he claimed, some employees were fired recently for violating that policy. As the scheduled portion of the hearing concluded, Miller invited other relatives of Upper Big Branch victims to come forward. Only Leo Long responded, dragging an oxygen tank with him to the witness table. Long raised his grandson, Ronald Lee Maynor -- a father of two -- who was killed in the explosion. Fighting back tears, Long pleaded with the congressional committee: "I'm asking you all to please do something for the rest of the coal miners that's in the mines. If you all don't do something, something like this will happen again."